Hagfish produce prodigious amounts of slime. 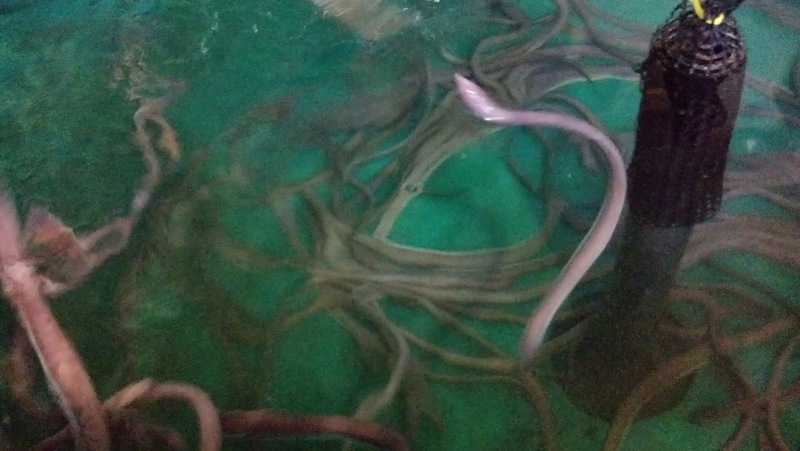 A single hagfish can fill a 5-gallon bucket with slime, seemingly instantly. This slime provides protection. Hagfish have been observed escaping from sharks by choking them with enormous amounts of slime. When they feed on a carcass, the slime pours out, covering the carcass and preventing other scavengers from creeping in on their turf. If not properly cared for, hagfish in captivity will suffocate in their own slime. So why is it all over my car? The hagfish were likely alarmed by the presence of your vehicle. This was a stress reaction. How do I clean it off? Hagfish slime is quite dense, you can scoop it off your vehicle. And the slime that’s all over me? Tie yourself into an overhand knot and then squeeze you head backwards around your torso. That’s what they do. No idea. Hagfish slime is so tough and dense that scientists are looking into using it to create natural lycra. You’re probably best just throwing your clothes out. Slime isn’t even the best term to describe this incredible substance. It’s comprised of viscoelastic microfiber filament that forms a semi-solid gel. It’s more like Spiderman’s webbing that gak (though they can’t shoot it and I wouldn’t try to swing from it). Do you think my insurance will cover me? This may technically count as an Act of Cod. 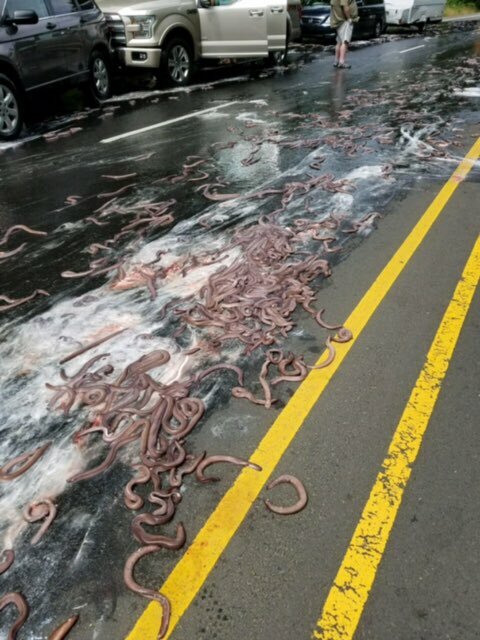 Back to the point at hand, why was there a truck full of hagfish driving down the highway? They were transporting a shipment bound, ultimately, for South Korea. South Korea is one of a few countries that eat hagfish. I hear they’re actually quite tasty. We eat the uncooked gonads of living oysters. There’s actually a fairly extensive hagfish fishery centered around Oregon, though I know some folks who fish for them on the Atlantic coast, too. Hagfish are extremely valuable in the South Korean luxury market, but they’re also sold in China, Japan, Europe, and the US. As fisheries go, it’s a relatively new one, but the evidence currently suggests that it’s sustainable when well-managed. Unfortunately, the reason we’re exporting them is that Korea did deplete its own hagfish fishery, so extensive monitoring is needed to ensure that the US-based fishery doesn’t suffer the same fate. There are also secondary markets for hagfish, as well. Most products marketed as “eel skin”, including wallets and belts, are actually hagfish. This is actually pretty neat. The hagfish fishery today is predominately a live-trade fishery for seafood, but when it started in the late 80s, we were all about hagfish skin. Hagfish secrete their slime through pores that cover their entire body, and for some reason, hagfish further south have more and bigger pores, which is considered poor quality for “eel skin” goods. So the southern fisheries didn’t last very long, and the fisheries in the Pacific Northwest were able to stick it out long enough for the live-trade to take hold. So, what’s a hagfish worth? Last I checked, they sell for about $20 USD per pound in Korean restaurants. For comparison, blue crabs in the US go for about $6 USD per pound unpicked (though we tend to sell by the bushel), or $18 USD per pound picked (which is just the meat). All these prices vary quite a bit, seasonally. 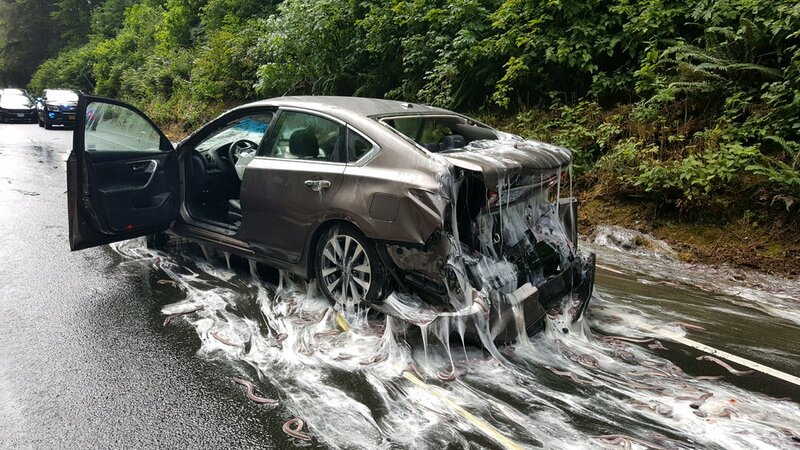 Your car was likely crushed by several thousand dollars worth of hagfish. Why are so many people asking me about hovercrafts? They’re either linguists or Monty Python fans. Probably both. No. No they will not. The hagfish or the Monty Python fans? Isn’t a Prius being crushed and slimed by a truck full of hagfish a metaphor for 2017 or something? Anything else you want to tell me about hagfish? People always find ways to be grossed out by strange marine creatures, but when you think about it, hagfish are magnificent. 300 million years ago, they figured out a good way to be a deep-sea scavenger and stuck with it. They’re efficient, tough, and stubborn. They secrete a viscous slime that’s unlike anything else in this world. We know almost nothing about them, but what we do know is nothing short of incredible. They are weird and they are wonderful. Sounds like they should have their own holiday. Hagfish Day is the third Wednesday in October. Where can I learn even more about these wondrous creatures? My all time favorite reference for hagfish (and for all fishes who lean Pacific) is Milton Love’s Certainly More Than You Want to Know About the Fishes of the Pacific Coast. It is, without a doubt, the most entertaining and informative taxonomy guide ever created. The Biology of Hagfish is also a great (though very expensive) resource. When I talk about Climate Change, I don't talk about science. Tangier, an Island out of Time. It’s here! The Official Schedule for #JacquesWeek 2017! Can I get a hagfish wallet that excretes copious slime only when touched by a stranger? cf This awesome episode of The Octonauts. But why a truck? Why not take it all to Portland in a boat? It’s already on a boat; just leave it there and head for Portland to crate up and ship. I saw this on mainstream news and they were laughing at it like it’s funny and was a photo op. It still amazes me the perceived ‘value’ we place on certain animals. If these were cattle, or dogs, i have no doubt it would illicit a stronger response. It’s appalling.